When life gives you lemons – make lemon water! It appears, lemons are not just for lemonade! 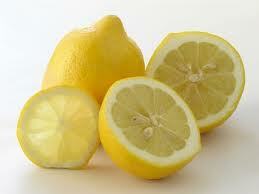 Lemons have a barrage of uses and benefits from beauty regimes, cleaning products, cooking, to fighting infections. Lemons are also a very powerful agent in fat loss. It’s the citric acid in lemons (containing the highest amount of any other fruit) that make them such a powerhouse among fruits. One of the reasons we hold on to extra body fat is related to a poor functioning digestive system. Poor digestion is a very common problem with most people and is often caused by an inconsistent diet, meaning, a diet lacking in certain nutrients. Those that follow different types of diet trends can aggravate digestive problems by restricting certain essential nutrients that the body needs to burn fat. Without the proper nutrients, digestion slows down which, in turn, slows down your metabolism and makes fat loss impossible. When the body is not receiving proper nutrients, it triggers a craving for these nutrients making you feel hungry when in actuality, you are not. How can lemons help this? It’s amazing what this little fruit can actually do! Most people eat foods that create an acidic environment in the body, which leads to all sorts of digestive and health problems. Ironically, lemons (even though they are high in citric acid) have an alkalizing or neutralizing effect in the body. The benefits stem from this alkalizing effect. Lemons help purify the liver by removing toxins. When there’s a build up of toxins in your body, it can result in feeling sluggish, bloated, and depressed. Toxins in the body also hold on to fat, so in order to lose the fat, you need to flush out the toxins. The added benefit of clearing toxic waste is a clear and glowing complexion! Add a wedge of lemon to your glass of water. A great weight loss aid! The peel of the lemon contains pectin which is a great source of fiber. Pectin helps slow down sugar absorption in the stomach which helps keep hunger cravings at bay, for up to 4 hours! A great way to get pectin in your diet: grate some lemon zest on your salad or in your pasta sauce. Can relieve digestive problems. According to The Lemon Juice Diet, drinking warm water with lemon juice first thing in the morning will stimulate the digestive system and have revitalizing effect on the liver. It can relieve digestive problems such as nausea, heartburn, constipation and parasites. Helps heighten immunity. Lemons contain Vitamin C which helps to prevent and treat different types of infections, allergies, and symptoms of asthma. Are you Having Dessert for Breakfast? Why your healthy “whole grain” choice might be equivalent to dessert in a bowl. Cereal is often the number one go-to breakfast choice for parents, considering it takes a mere 30 seconds to throw together and serve, and it is widely accepted by kids. After all, it’s crunchy, fun to eat, and often sweet. In fact, cereal is a lot sweeter than most people realize, especially those cereals that are marketed to kids. What may seem like a healthy “whole grain” choice, may actually be the equivalent to serving your kids dessert for breakfast. The Environmental Working Group (EWG) recently conducted an analysis on over 1500 breakfast cereals —including 181 cereals specifically marketed to children—and figured out that a child who eats a bowl of cereal a day for a year would end up consuming about 10 pounds of sugar from that source alone. In the document, it states that the most popular children’s cereals average about two teaspoons of sugar per serving, which is similar to three “Chips Ahoy” cookies. Over one third of the calories in a serving of children’s cereal came from sugar alone, and most of these cereals contained over a third of the recommended daily amount of sugar. Out of the 181 cereals that were specifically marketed to kids, very few were low in sugar and there wasn’t a single one that did not contain added sugar, which clearly indicates that the manufacturers are capitalizing on children’s biologically-driven affinity for sweet foods. Not surprisingly, the EWG found that the health claims plastered all over cereal boxes (“Good source of fibre” or “Excellent source of Vitamin D”) often distracts consumers from what actually matters—the ingredients . As mentioned in the MacLeans Magazine cover story, “Death By Sugar,” that unveils the truths about the damaging health effects of sugar, Canadians eat, on average, about 88 lbs of sugar per year. What’s more shocking is that the average 9-year-old boy eats 126 lbs of sugar per year, and the average male teen, 138 lbs. As a Dietitian, this sadly doesn’t surprise me too much—I’ve seen some fairly shocking food journals in my counseling practice, many that absolutely ooze SUGAR. Sugar appears in everything from cereal to salad dressing, and from condiments to crackers. If it comes in a package or box—even if it claims to be healthy in some way—it likely contains added sugar. This is why my family and I decided to cut back significantly on processed, packaged foods. We didn’t make the now-popular resolution to go “sugar-free” (because I knew that was unrealistic for us), but rather to focus on whole foods that come in their natural form—fruits, veggies, intact whole grains, eggs, hormone/antibiotic-free meats, beans and lentils, etc. In doing that, we naturally cut back on our sugar consumption by A LOT. What draws many families to boxed cereal (among other processed, packaged foods) is the convenience factor. As a Mom to a three-year-old and 10-month-old, I get it. But I also know that what we feed our kids now will affect them long-term. As parents, we set the stage for what our kids will view as “normal” when it comes to food. If we’re constantly feeding them food from a package, they will grow accustomed to the over-powering sugary, salty tastes and perhaps not appreciate the true flavors of real food. They will grow to think that eating means opening a package or box. Cooking from scratch not only benefits our kids (and ourselves) from a nutrition stand-point, but also opens up the opportunity for kids to learn how to cook and prepare food —something that will benefit them for life. It may seem impossible to trade your favorite breakfast cereal in for something healthier, but it’s not. 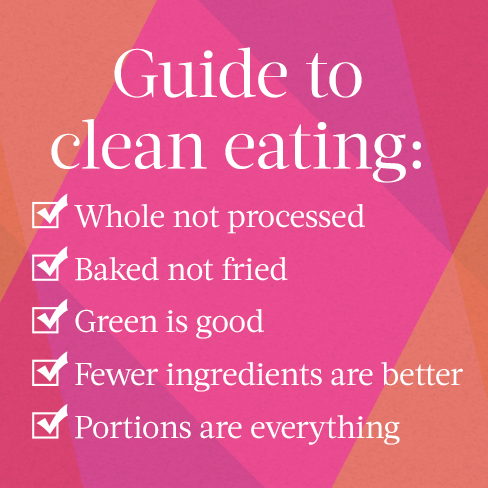 There are plenty of healthy-but-still-easy options out there. If you absolutely can’t kick your cereal habit, make sure that you’re reading the ingredients list first and foremost. If sugar (or any form of sweetener, such as brown rice syrup, agave syrup, glucose, honey etc.) is one of the first 3 ingredients, put it back. If there are more than 6 or 7 ingredients total (unless they are all natural ingredients that you recognize), put it back. When looking at the nutrition facts table, aim for at least 4 grams of fibre and less than 8 grams of sugar per 30 gram serving size. Read more here about why you should always read the ingredients list on food products and the top five ingredients to avoid. Cold cereal isn’t the only convenient option. Hot cereal is our favorite go-to breakfast, because it’s much more filling and satisfying and the kids love it. Our favorite is slow-cooker steel-cut oats . It’s great because I can prepare it the night before, but if I forget, I’ll throw 1/3 cup rolled oats into a bowl with 2/3 cup milk and a pinch of salt, microwave on high for 2 minutes, and then add berries and a bit of maple syrup or vanilla yogurt. A fruit smoothie is another easy but healthy option. Use milk, yogurt, nut butters, and seeds to boost the protein content for a more filling smoothie, skip the fruit juice and go easy on added sweeteners, such as honey or maple syrup. Protein-packed eggs are also an excellent breakfast option, perhaps paired with fruit and a homemade high-fibre muffin . A breakfast that includes protein has shown to help prevent unhealthy snacking later in the day. Having cereal once in a while is not a huge deal, much the same as enjoying any treat or “fun” food. Making cereal your morning staple, however, is not healthy. Most cereals are not “health foods” as they claim, but more so sugar-ladened processed grains in a box that I consider to be “non-foods”. The Environmental Working Group (EWG) recently conducted an analysis on over 1500 breakfast cereals—including 181 cereals specifically marketed to children—and figured out that a child who eats a bowl of cereal a day for a year would end up consuming about 10 pounds of sugar from that source alone. In the document, it states that the most popular children’s cereals average about two teaspoons of sugar per serving, which is similar to three “Chips Ahoy” cookies. Over one third of the calories in a serving of children’s cereal came from sugar alone, and most of these cereals contained over a third of the recommended daily amount of sugar. Out of the 181 cereals that were specifically marketed to kids, very few were low in sugar and there wasn’t a single one that did not contain added sugar, which clearly indicates that the manufacturers are capitalizing on children’s biologically-driven affinity for sweet foods. Not surprisingly, the EWG found that the health claims plastered all over cereal boxes (“Good source of fibre” or “Excellent source of Vitamin D”) often distracts consumers from what actually matters—the ingredients. As mentioned in theMacLeans Magazine cover story, “Death By Sugar,” that unveils the truths about the damaging health effects of sugar, Canadians eat, on average, about 88 lbs of sugar per year. What’s more shocking is that the average 9-year-old boy eats 126 lbs of sugar per year, and the average male teen, 138 lbs. As a Dietitian, this sadly doesn’t surprise me too much—I’ve seen some fairly shocking food journals in my counseling practice, many that absolutely ooze SUGAR. Sugar appears in everything from cereal to salad dressing, and from condiments to crackers. If it comes in a package or box—even if it claims to be healthy in some way—it likely contains added sugar. This is why my family and I decided to cut back significantly on processed, packaged foods last Fall. We didn’t make the now-popular resolution to go “sugar-free” (because I knew that was unrealistic for us), but rather to focus on whole foods that come in their natural form—fruits, veggies, intact whole grains, eggs, hormone/antibiotic-free meats, beans and lentils, etc. In doing that, we naturally cut back on our sugar consumption by A LOT. What draws many families to boxed cereal (among other processed, packaged foods) is the convenience factor. As a Mom to a three-year-old and 10-month-old, I get it. But I also know that what we feed our kids now will affect them long-term. As parents, we set the stage for what our kids will view as “normal” when it comes to food. If we’re constantly feeding them food from a package, they will grow accustomed to the over-powering sugary, salty tastes and perhaps not appreciate the true flavours of real food. They will grow to think that eating means opening a package or box. Cooking from scratch not only benefits our kids (and ourselves) from a nutrition stand-point, but also opens up the opportunity for kids to learn how to cook and prepare food—something that will benefit them for life. It may seem impossible to trade your favourite breakfast cereal in for something healthier, but it’s not. There are plenty of healthy-but-still-easy options out there. Cold cereal isn’t the only convenient option. Hot cereal is our favourite go-to breakfast, because it’s much more filling and satisfying and the kids love it. Our favourite is slow-cooker steel-cut oats. It’s great because I can prepare it the night before, but if I forget, I’ll throw 1/3 cup rolled oats into a bowl with 2/3 cup milk and a pinch of salt, microwave on high for 2 minutes, and then add berries and a bit of maple syrup or vanilla yogurt. I also made this delicious breakfast quinoa recipe the other day and it was a huge hit. A fruit smoothie is another easy but healthy option. Use milk, yogurt, nut butters, and seeds to boost the protein content for a more filling smoothie, skip the fruit juice and go easy on added sweeteners, such as honey or maple syrup. Protein-packed eggs are also an excellent breakfast option, perhaps paired with fruit and a homemade high-fibre muffin. A breakfast that includes protein has shown to help prevent unhealthy snacking later in the day. Here are a few more easy, healthy, kid-friendly breakfast options if you’re interested. Having cereal once in a while is not a huge deal, much the same as enjoying any treat or “fun” food. Making cereal your morning staple, however, is not healthy. 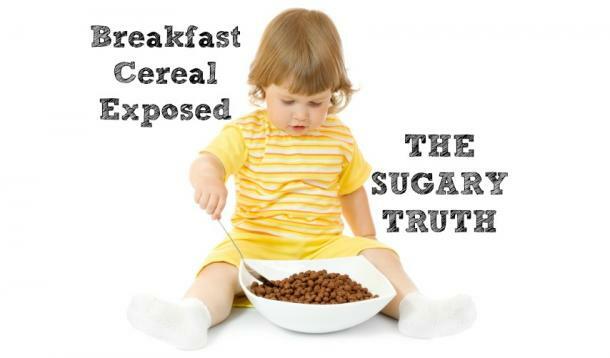 Most cereals are not “health foods” as they claim, but more so sugar-ladened processed grains in a box. Omega-3 Fats Offer Oh Mega Benefits! In adults, they act as a natural blood thinner, reducing risk of blood clots and heart disease and potentially have beneficial effects related to cancer and inflammatory bowel disease. Since our bodies can’t make omega-3 fats, we need to get them from food. Research shows that our bodies are better able to absorb DHA and EPA than ALA, so aim for 2 servings of fish per week to meet your needs. One serving is equal to 1/2 cup or the size of a deck of cards. If you’re vegetarian, vegan or simply don’t like the taste of fish, first try and increase your consumption of plant sources of omega-3’s (see “Featured Product” section). You may also benefit from an omega-3 supplement. Speak with your health care professional before starting an omega-3 supplement. 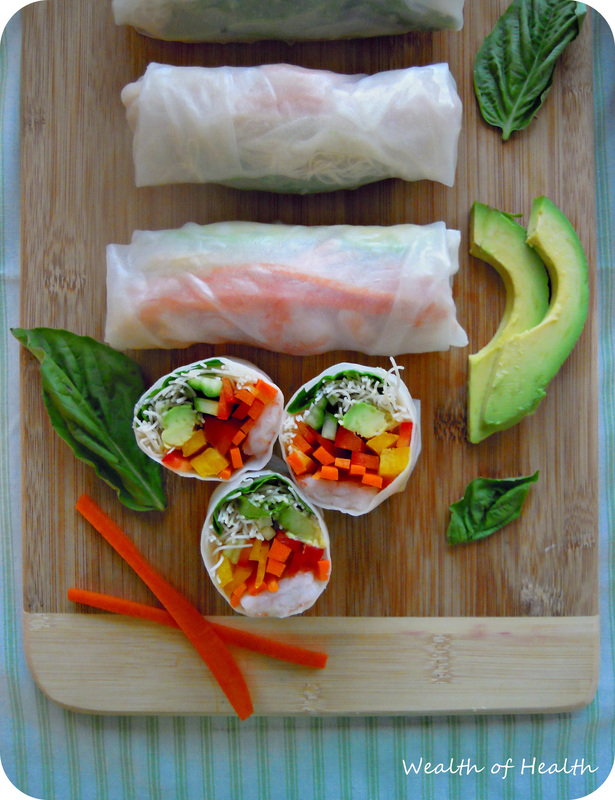 Embrace Spring with these Vietnamese spring rolls! They’re not only super tasty, but also healthy and packed with layers of flavoursome crunch. They’re great as a cool summertime appetizer, or even as a main dish, especially dipped in this zesty homemade peanut sauce. Typically, flaxseed oil has a low smoke point, meaning that it’s not appropriate for cooking at high temperatures, because it will start to degrade. This particular flaxseed oil has been cold-pressed (no chemicals involved) to give it a high smoke point, so it’s great for cooking! It’s also perfect for salad dressings, or used in place of any other oils you might use. The high amount of omega-3 fats in Alligga flaxseed oil, make it a great alternative for people who don’t like to eat fish. Did you know that vitamin C increases the absorption of iron in the body? Many of us (mainly females) are deficient in iron to some degree. 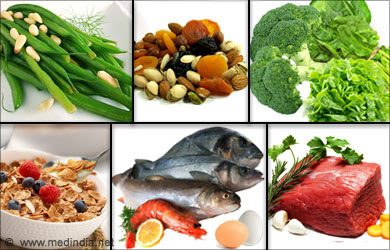 It’s best to get our iron from food sources, as iron supplements can cause side effects like nausea and constipation. Iron is found in both animal and plant foods. Animal sources of iron (red meat, poultry, seafood, eggs, etc.) are better absorbed by the body than plant sources (beans, lentils, dark leafy green vegetables, etc). So if you’re trying to increase your iron through foods, be sure to eat a vitamin C-rich food along with it (especially if you’re vegetarian). For example, drizzle lemon juice onto your salad greens; add blueberries to your oatmeal; toss your favourite lentil dish with fresh red bell pepper. Why are Coffee & Tea Amazing For You? There’s nothing like a hot cup of coffee or tea to start the day. Some may go as far as to say they can’t function without their daily dose of caffeine! While some studies celebrate these beverages, others claim they’re bad for us. So should you toss your favorite drink or ignore the naysayers? Let’s find out. There are 80-185 milligrams of caffeine per cup of coffee versus 15-70 mg of caffeine per cup in tea. Coffee comes from the berries of an evergreen plant and tea comes from a variety of plant leaves. But how much do we actually drink? 52 percent (or 100 million) American adults drink coffee daily. The average coffee drinker has 3.1 cups per day, or 70 gallons a year, enough to fill a bathtub. 30 percent of coffee drinkers enjoy specialty drinks like lattes and cappuccinos. 274 million pounds of tea were imported in 2010, the same as a large cruise ship. The average American drinks 155 cups of tea annually, or 10 gallons a year. 78 percent of tea consumed globally is black, which is preferred by North Americans. 20 percent is green and 2 percent is oolong. There are so many different types of tea that you’ve probably heard some are good for you and some aren’t. Studies on rat fat cells shot that brewed tea of any kind increases insulin activity by up to 15 times. Green tea is full of antioxidants that may help prevent many forms of cancer, including breast, lunch, and stomach. Green tea may also help prevent arterial clogging and reduce the risk of stroke. Green tea might also reduce neurological damage due to oxidation, which in turn prevents Alzheimer’s and Parkinson’s. It can burn fat and improve cholesterol levels. Ninety percent of tea consumed in the U.S. is black. It is made from fermented leaves and is the highest in caffeine. Due to the fermentation process, black tea is lowest in monomeric catechins, which have been linked to cancer prevention. This tea may protect you from have a stroke or developing heart disease by helping blood vessels dilate correctly. It has also been linked to preventing lung damage from smoking. White tea is unfermented and made from young buds and leaves. It offers the most powerful antioxidants of all the teas. Oolong tea has many different forms, which is fermented and may prevent weight gain and promote weight loss. It may also help to prevent tooth decay. Chances are, you’ve heard ideas like coffee will stunt your growth or give you heart disease or stomach cancer, but fortunately, none of these are true. In fact, it can actually be good for you. Coffee has been linked to improved memory recall. It may also help prevent Alzheimer’s, heart disease, gout, type 2 diabetes, and Parkinson’s. The caffeine in coffee can help ease asthma attacks. Coffee drinkers are 50 percent less likely to get liver cancer than those who avoid the beverage, though the exact reason has not been pinpointed. It may also lower the risk of breast, rectal, and colon cancers. Caffeine can increase energy expenditure (calorie burning). One study showed that those drinking caffeinated liquids burned 67 calories more than those who drank water, the equivalent of a medium-sized apple. While a little caffeine can be good for you and help keep you awake, too much isn’t a good idea. It may cause restlessness, insomnia, and anxiety. Experts recommend limiting your daily caffeine intake to 400 mg for men and 300 mg for women. That’s roughly 4 cups of coffee/6 cups of tea for men and 3 cups of coffee/4 cups of tea for women. Caffeine provides many healthy benefits, too. It helps increase endurance during workouts and may blunt pain and tiredness, letting you work out longer. It may enhance muscular contractions during exercise. As with any health advice, people should drink coffee and tea in moderation, as too much of a good thing can be…well, dangerous. While researchers have dispelled many common myths surrounding these beverages, it’s still a good idea to drink tea and coffee in small doses.